Police are investigating after several gunshots were fired at a car in the Craigton area of Glasgow. Officers were called to Torbreck Street, near Bunessan Street, just before 13:00 on Monday. Several members of the public reported hearing what they believed to be a gun being fired in the area at the time. 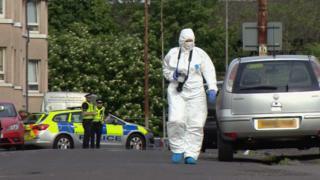 Following a forensic examination of the scene, police said a number of shots had been fired at a Toyota Avensis car. No-one was injured in the incident. A black car, possibly a Mercedes, was seen driving at speed from Jura Street onto Paisley Road West around the time of the incident and police are appealing for any witnesses to come forward. The attack follows the attempted murder of a man who was shot at as he sat in his car in the city's Scotstoun area on Sunday. Det Insp Sarah McArthur, from Govan CID, said: "Inquiries are at a very early stage to establish the full circumstances of this reckless crime and it is absolutely vital that anyone with information comes forward to help us piece together what has happened here. "We have had no reports of anyone being injured, however we must confirm whether there was anyone in, or near to, the vehicle at the time. "This is a busy residential area and I would appeal to anyone who was near to Torbreck Street yesterday afternoon, who may have noticed someone in, or near to, the vehicle targeted, to please get in touch. "I would also ask anyone who may have noticed a black car, any other vehicles or anything at all untoward, to pass this information on to police. "This incident will understandably cause concern within the local community and additional patrols will be in the area to provide reassurance. Anyone with information or concerns is welcome to approach our officers who will be happy to speak to them."